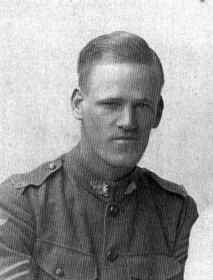 Aubrey William Frederick Appleby (Service No 818), was born in Launceston, Tasmania in 1894. At enlistment, he was single, 20 years old, worked as an orchardist and had served 3 years with the Senior Cadets. Aubrey initially listed his brother, in Wollongong, N.S.W., as his next of kin but changed it to Mary Stevenson, of Wollongong, N.S.W. Aubrey embarked from Brisbane, QLD, on HMAT A60 Aeneas, with 26th Battalion, C Company, on 29th June 1915. He arrived in Egypt, and was then sent to Gallipoli, Turkey, on 4th September 1915. On 3rd March 1916, Aubrey was transferred to 5th Machine Gun Company, arriving in France, with them, on 21st March 1916. He saw service on the Western Front, and was promoted to Corporal on 6th December 1916, and to Sergeant, on 5th June 1917. Aubrey also served as a trainer, in England. On 15th February 1919, he married Lillian Knight, in Olney, England, and she returned to Australia with him, in November 1919. He was discharged on 8th March 1920. Aubrey returned to Tasmania, where he and Lillian had one child. Aubrey died on 3 June 1934, and is buried in Cornelian Bay Cemetery, Tasmania.